This page is dedicated to the three enterprising visionaries who brought high-fidelity stereophonic music into the home: Emory Cook of Cook Laboratories; C.E. (Ched) Smiley of Livingston Electronic Corp. and Sidney Frey of Audio Fidelity Inc. The first time the public heard true high fidelity stereophonic sound was in a movie theatre and that story can be found on this page: First Year of Stereophonic Motion Pictures. The dawn of Hi-Fi music in the home began with the release of mono pre-recorded music on reel to reel tape by Recording Associates in 1950. The full story can be found on this page, Binaural or Bust. This article will document the first year of stereo vinyl beginning with the Westrex demonstration at the AES convention on October 11, 1957 through December 31, 1958. Please note that I will only list the first stereo releases from each label. Most labels issued new stereo albums every month and many of those subsequent releases can be found in the mid-month checklists beginning on July 12, 1958. Over the years, many people have assumed the initial stereo disc releases from each label could be determined by referencing catalog numbers. That is not the case. When stereo records went into production in the summer of 1958, the labels selected their most popular mono titles for most of their inaugural stereo releases. Therefore, an album that was initially released in mono in 1956 may not have appeared on stereo vinyl until 1959 or 1960. In order to make this listing as complete and accurate as possible, I have done original research and the data on this page was compiled from documented primary sources. The information was found in Billboard, Cash Box, Audio Magazine, Saturday Review, High Fidelity, HiFi & Music Review, Magnetic Film & Tape Recording, Variety, Complete Catalogue of Stereo Music, Schwann Long Playing Record Catalog and assorted vintage newspapers. March 12, 1955: London Records preparing stereo discs. March 1955: Roland Gelatt reports in High Fidelity. April 12 - 16, 1957: Connoisseur stereo discs are heard at the London Audio Fair. June 24, 1957: RCA Victor makes their first disc announcement. July 1957: Irving M. Fried reports on the Connoisseur demonstration in High Fidelity. August 1957: Roland Gelatt reports on the Connoisseur demonstration in High Fidelity. October 7 - 12, 1957: The New York High Fidelity Show is held at the Trade Show Building. Stereo discs are not publicly exhibited at the event but both London and Westrex have demonstrations at other locations. The Westrex Stereodisk System is heard publicly for the first time on October 11, 1957 at the Audio Engineering Society convention in the Trade Show Building. Pressed on that first 45-45 stereo disc is a Capitol tape that was released in July 1957; INTRO TO STEREO. That disc is released commercially by Capitol on August 18, 1958 as THE STEREO DISC. The audio starts at 1:26. November 13, 1957 (date in matrix): 500 copies of the first Stereodisc (AFLP 1872) are made for Sidney Frey. Side one contains six tracks from AFLP 1851 and side two is AFLP 1843. December 13, 1957: The Audio Fidelity test disc is first heard publicly in New York. January 13, 1958 - Fairchild cartridge introduced. February 14 - 16, 1958: Audio Fidelity distributes the first Stereodiscs to exhibitors in San Francisco. February 15, 1958: Audio Fidelity to release four Stereodisc albums. February 24, 1958 - Fairchild begins production of first cartridge. Please note: Nearly all of the covers pictured below are the original 1958 pressings. Many labels initially used mono covers with stickers indicating a stereo album. Others, such as Warner Bros. and World Pacific, used baggies with stereo text. As you can imagine, those copies are quite rare today. The initial 10,000 discs used a mono cover with a gold Stereodisc sticker physically attached to the front. Once new covers were ready for the second pressings, the revised Stereodisc stickers (which included the respective album numbers) were part of the artwork. If you'd like to find the first copies, look for this sticker. March 15, 1958: Counterpoint announces their first two releases. March 1958: Fairchild Recording advertisement. March 25, 1958: RIAA sets standards. March 31, 1958: Majors hold back while independent labels rush to release product. April 7, 1958: Magnavox is the first to offer stereo players. April 9, 1958: Columbia and RCA battle over standards. April 14, 1958: Audio Fidelity sales boom. April 19, 1958: Celestial Records announces stereo discs. We can find no further reference to these Celestial albums in stereo. If you have any additional information to confirm their release, please let us know. April 21, 1958: Recording techniques. April 26, 1958: Audio Fidelity public demonstration. May 1, 1958: Urania releases five albums. discusses the first six releases. May 1958: Audio Fidelity releases four additional albums. Early May 1958: ABC-Paramount releases six albums. May 1958: The first 10-inch stereo sampler is released. May 1, 1958: Stereo Records releases six albums. May 8, 1958: Hallmark releases nineteen albums. HLP 301 – The Name’s Haymes! May 12, 1958: Hi-Fi to release eight albums. May 12, 1958: Majors to release in the summer. May 19, 1958: Concert-Disc releases their first album. May 20, 1958: Stereo Fidelity releases twenty albums. 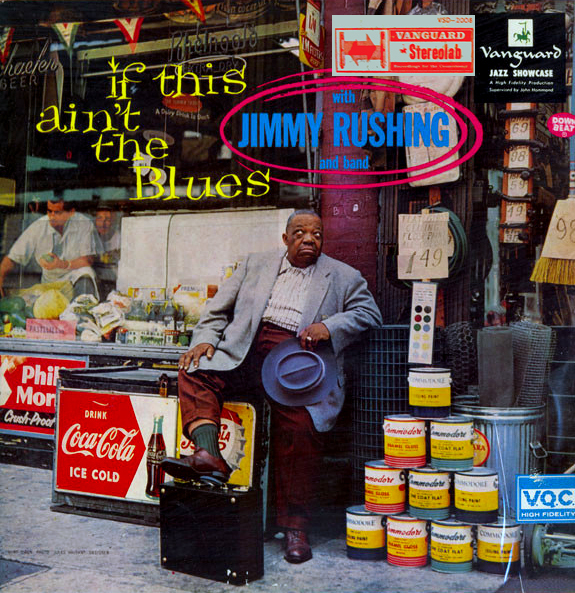 The original May 1958 pressings have the Stereo Fidelity logo in raised lettering on the front cover along with the sound spectrum chart in full color on the back cover. The later pressings dropped the embossed lettering and printed the chart in black and white. May 25, 1958: Omega Disc releases four albums. Late May, 1958: Bel Canto releases two albums. "Destination Moon" and "Champagne Music for Dancing." The first pressings for Bel Canto and Omega Disc are issued in a deluxe box. May 26, 1958: World Wide releases five albums. Late May: Montilla releases the first ten Latin albums. May 30, 1958: Elektra releases a $2.98 sampler disc, SMP-4X. of stereo discs released on May 10, 1958. May 31, 1958: Atlantic releases three albums. June 1958: Advertisement for the Stereophonic Music Society in High Fidelity. June 1958: Counterpoint releases six additional albums. June 1958: Vanguard releases nine albums. June 1, 1958: Elektra releases three albums. June 1958: Stereovox releases a $2.98 sampler disc, VST-1. 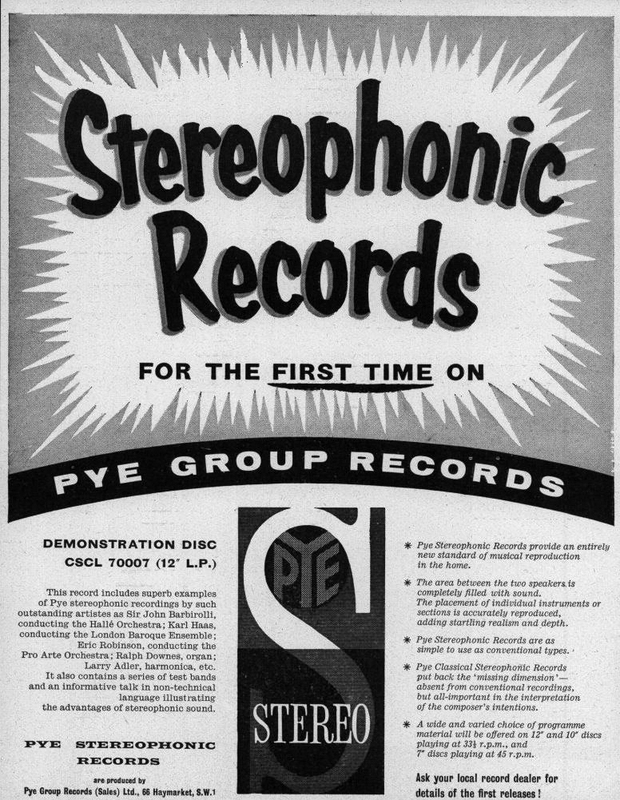 June 1, 1958: Pye issues the first stereo discs in London. June 14, 1958: RCA Victor announces fifty-five Living Stereo albums. HI-FI FIEDLER is the first sent out for review in early July and the first group of twenty-three titles is released on August 4. 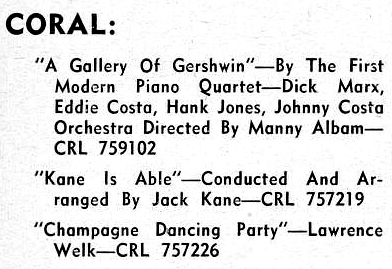 Mid-June 1958: Grand Award releases eight albums. June 16, 1958: London announces demonstration disc, PS 100. June 20, 1958: Westminster releases one album. June 22, 1958: Cook releases three albums. June 23, 1958: Bel Canto is the first to release four stereo singles. June 25, 1958: Liberty releases four albums. June 28, 1958: King announces their first release. June 28, 1958: Riverside and Judson announce their first four releases. June 28, 1958: Seeco announces promotional EP for their first four albums. June 30, 1958: Sales are encouraging. June 30, 1958: Bell Telephone Hour and Newport Jazz Festival in AM-FM stereo. July 1958: Stereo Disc Roundup. July 1, 1958: RCA Victor releases twenty-seven stereo EP's. July 1958: Jubilee releases five albums. July 1958: Rondo releases twelve albums. July 1958: Stereovox releases fourteen albums. July 5, 1958: Coral releases their first album. Early July 1958: Mercury releases twelve albums and stereo sampler SRD-1. Early July 1958: Westminster releases fourteen albums. July 7, 1958: Emory Cook releases stereo sampler. July 12, 1958 - Morton Gould arranges for stereo. July 14, 1958: Compatibility confusion. July 21, 1958: Concert-Disc releases five additional albums. July 27, 1958: The Miami News reports on compatibility issues. July 28, 1958: Bert Parks' Bandstand broadcasts in AM-FM stereo. July 28, 1958: Columbia releases twenty albums. August 1958: World Pacific releases four albums. August 1958: Crown releases fifteen albums. August 1958: Fiesta releases three albums. August 1, 1958: Vanguard issues the first stereo album for children. 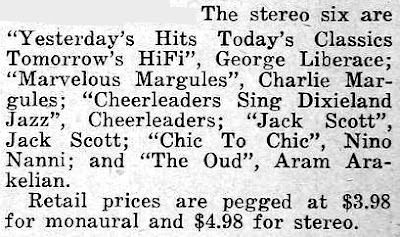 August 2, 1958: Stereo Fidelity releases a $1.98 sampler disc. August 2, 1958: Epic announces their first nine albums. August 4, 1958: RCA Victor releases their first twenty-three albums. August 5, 1958: London releases seventy-five albums. August 7, 1958: Chillicothe Gazette on stereo samplers. August 1958: RCA releases stereo sampler, SP-33-13. August 11, 1958: Fantasy announces ten albums. August 16, 1958: RCA Camden announces three albums. August 18, 1958: Counterpoint releases $2.98 stereo sampler, CPST 2505. August 18, 1958: Capitol releases fifteen albums. August 18, 1958: Angel releases seven albums. August 1958: Dot releases twelve albums. August 18, 1958: Coral releases three additional albums. August 25, 1958: Multiple labels issue stereo samplers. August 25, 1958: Audio Fidelity sues Stereo Fidelity. September 1958: Westminster releases $2.98 sampler disc, WSS-1. September 1958: Imperial releases twelve albums. September 1958: Period Music Co. releases fifteen albums. September 1958: Kapp releases sixteen albums. September 1958: Cambridge releases one album. September 1958: Boston releases five albums. September 6, 1958: Columbia releases $5.98 stereo sampler, SF-1. September 6, 1958: Cameo releases three albums. September 6, 1958: Wurlitzer introduces the first stereo jukebox. September 8, 1958: Stereo singles for jukeboxes. September 8, 1958: MGM sends their first stereo single to radio stations. September 1958: Brunswick releases one album. September 8, 1958: Audiophile releases three albums. September 10, 1958: Who's buying stereo records? September 10, 1958: Lawrence Welk broadcasts in stereo. Variety reviews the Lawrence Welk stereo premiere. September 15, 1958: 101 Strings are the top sellers in stereo. September 15, 1958: Stereo discs should be played loud. September 20, 1958: Roulette releases six albums. September 20, 1958: Mayfair announces twelve albums. September 22, 1958: RCA announces stereo 45's. September 22, 1958: RCA advertisement. September 28, 1958: Grand Award releases $2.98 stereo sampler, GA 400. September 28, 1958: Warner Bros. releases twelve albums. October 1, 1958: Lawrence Welk broadcasts weekly on ABC TV in stereo. October 1958: Stereo Fidelity advertisement in High Fidelity. October 1, 1958: Tampa releases four albums. October 1958: Bel Canto releases stereo sampler: SR 1000. October 1958: Audio Fidelity releases stereo sampler: AFSD 5890. October 1958: Omega releases $5.98 stereo sampler, OSD-1. 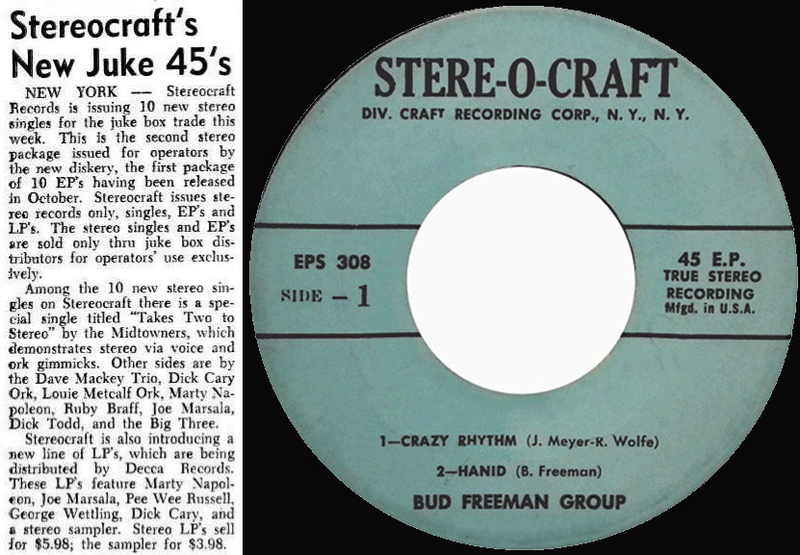 October 1958: Stere-O-Craft releases ten stereo EP's. They release a second group in November. October 1958: International releases one album. October 1958: Colpix releases one album. October 1958: Sumco releases three albums. October 1958: Lyrichord releases three albums. October 1958: Stereo Age releases two albums. October 1958: Verve releases one album. October 1958: Decca releases ten albums. October 4, 1958: Design/Stereo Spectrum releases ten albums. The first pressings are issued in a deluxe gatefold cover with a record cleaning cloth. October 4, 1958: MGM releases ten albums. October 5, 1958: Salt Lake Tribune on the best releases. October 6, 1958: RCA Bluebird releases the first stereo album for moppets. October 6, 1958: Columbia advertisement. October 6, 1958: Everest releases ten albums. October 13, 1958: Lawrence Welk leads in stereo. Mid-October 1958: Argo releases five albums. Mid-October 1958: Sacred releases seventeen albums. October 18, 1958: Carlton releases six albums. The first pressings are issued with raised velvet lettering on the word stereo. October 20, 1958: RCA stereocasts. October 21, 1958: NBC broadcasts George Gobel in Living Stereo and Living Color. October 23, 1958: Variety review. Late October 1958: United Artists releases eight albums. October 25, 1958: Disneyland releases five albums and $4.98 sampler disc, STER-X 4000. October 27, 1958: Stereo singles and EP's checklist. October 30, 1958: RIAA defines stereo. November 1, 1958: Seeburg introduces their stereo jukebox. November 1958: Kandy releases one album. November 1958: Monitor releases one album. 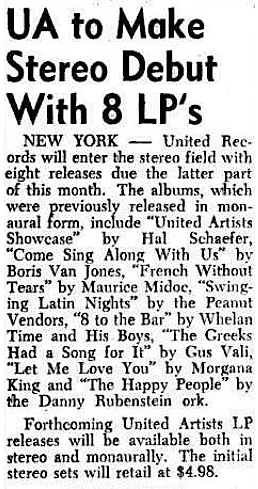 November 1958: Urania releases $2.98 sampler disc, SS-58. November 1958: Halifax releases two albums. 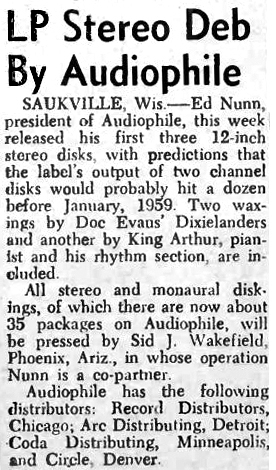 November 1, 1958: Gimmick stereo disks are the most popular. November 1, 1958: Audio Fidelity at the New York Hi-Fi Show. November 10, 1958: Dyer-Bennet releases one album. November 10, 1958: Aamco releases ten albums. 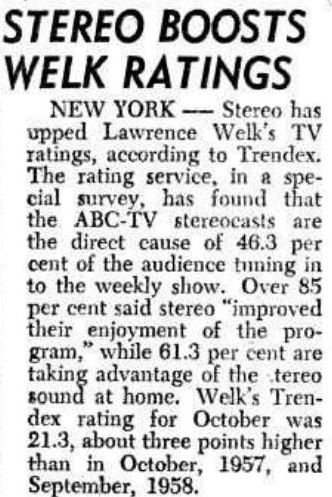 November 10, 1958: Lawrence Welk ratings boost from stereo. November 12, 1958: Jubilee releases ten stereo singles. November 16, 1958: Stereo Fidelity advertisement in Life Magazine. November 22, 1958: MGM releases nine additional singles. November 22, 1958: Rock-Ola introduces their stereo jukebox. November 24, 1958: Columbia advertisement. November 24, 1958: Savoy releases four singles. November 29, 1958: AMI introduces a stereo jukebox attachment. Late November 1958: Warner Bros. releases eighteen EP's. December 1958: Roulette releases $2.98 sampler disc, SR-100. December 1958: Stereo Age releases five additional albums. December 1, 1958: Stereo phono sales. December 1, 1958: Sunbeam releases one single. December 1, 1958: Carousel releases one single. December 6, 1958: Stereo-Gems releases six singles. December 8, 1958: Advertising stereo. December 8, 1958: ABC-Paramount releases eight singles and one EP. Mid-December 1958: Challenge releases one album. December 15, 1958: Counterpoint releases two singles. December 15, 1958: Rondo-lette releases ten albums. Mid-December 1958: Kandy releases their second album. December 20, 1958: Stere-o-craft releases eight albums. December 20, 1958: Stereo releases five singles. December 22, 1958: Fiesta releases $2.98 stereo sampler, FLPS-1238. December 22, 1958: Columbia recording Percy Faith's Orchestra. December 29, 1958: Roulette releases ten singles. Billboard: "Roulette Records has entered the stereo singles market. The label's first stereo singles release spotlights 10 disks, all taken from current Roulette stereo LP's. The stereo singles, which retail for 98 cents, include sides by Jimmie Rodgers, Tyree Glenn, Joe Williams, Count Basie, Joe Newman and Marco Rizo. Basie is represented by three separate platters while Rodgers and Glenn each have two singles in the stereo release." with primary documentation, let us know. By the end of 1958, Stereo Fidelity placed ads announcing they were the top-selling stereo label. If you have any additions or corrections to this data, please get in touch. Thank you very much!